Come look at the colorful map of which team is most popular by county. Hint: The Yankees are all over the place. Uh oh, people are gonna be mad at that headline! 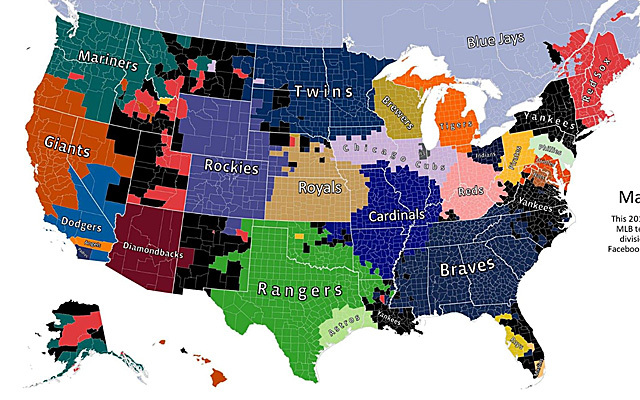 Want a general cross section of what Major League Baseball team is liked most by region? Of course you do. It's very important. So here, thanks to Facebook, is a color-coded map, by county, with the most popular team in terms of Facebook likes. Obviously this can't be 100 percent accurate because not all MLB fans are on Facebook, but the number of participants in this far exceeds any sort of polling people do on any subject. - The Yankees are, unsurprisingly, the most popular team in the nation and, per Facebook, we see them above in at least one county in 24 different states. So let's stop with the "no one but the media cares about the Yankees" comments, please. (I know, I know, this is a suggestion that will go unheeded). TV Ratings, Internet pageviews and, yes, Facebook "likes" continue to show it's the complete opposite. - You don't see a single county above for the Mets or Athletics while the Yankees and Giants have large areas. The White Sox only have four counties while the Cubs have a massive following. The Dodgers dwarf the Angels and Padres in SoCal, too. This isn't all too surprising. We know which regional "rivalry" teams are more popular. This indirectly causes fans of the less liked teams to proclaim that "real baseball fans" like theirs. 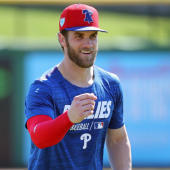 You hear that, Yankees, Giants, Cubs and Dodgers fans: You are fake baseball fans! - The Blue Jays have zero counties in the United States, but almost all of them in Canada. Not shocking. - Hawaii is all Giants except Oahu, which is Yankees. I'm guessing maybe because this is where Honolulu is located and maybe has the most transplants? Maybe? - Alaska's a cross section of Yankees, Red Sox and Mariners. - That random county in the middle of Oregon goes Red Sox, while the rest of the state is either Giants or Mariners. Interesting. - And then a random Pirates county in Idaho! - Speaking of, I see five colors in Idaho (Mariners, Giants, Yankees, Red Sox, Pirates), five in Montana (Mariners, Red Sox, Yankees, Cubs and Twins), five in Louisiana (Astros, Yankees, Red Sox, Braves and Rangers) and five in New Mexico (Diamondbacks, Yankees, Rockies, Red Sox and Rangers). The leader, though, is Nebraska with six different favorite teams (Rockies, Yankees, Red Sox, Royals, Twins and Cubs). Anyway, I found this interesting. I'm from central Indiana and I'm often asked from people in other states who the popular teams are here. It's a mix of Cubs, Reds, White Sox and even some Cardinals, Indians or Tigers fans. But mostly Cubs, I felt like. The Facebook map above backs it up.